A lawyer is poised to sue New York City for ordering mandatory measles vaccinations in the toughest action against the virus in US history. Mayor Bill de Blasio declared a state of emergency on Tuesday, which, he said, gave him the power to require vaccinations in Brooklyn’s Williamsburg neighborhood, where more than 250 measles cases have been reported since September, particularly in the Orthodox Jewish community. Those who refuse could face fines of up to $1,000 or six months in jail, according to New York Senate emergency laws cited by de Blasio and other city officials at the press conference. But Michael Sussman, a civil rights lawyer, says there are not enough cases to warrant a state of emergency, and he plans to have a case filed against the city by Friday. He will argue the case violates state laws and disproportionately targets minority religious groups. Sussman last week forced a judge in upstate New York’s Rockland County to allow unvaccinated kids back at school despite hosting the state’s other major measles outbreak, with 168 cases since last fall. Since de Blasio’s announcement on Tuesday, he says, he has been contacted by dozens of families to repeat his performance, this time downstate. ‘The rule of law is critical. We have a country that is already leaning towards authoritarianism, with regards to immigration. De Blasio is pushing for extra-legal measures,’ Sussman told DailyMail.com. He added: ‘This does not qualify as an extreme emergency. ‘New York City has a carefully crafted set of public health laws. In the case of an outbreak of a contagious disease, those laws allow for quarantine to stop its spread, they also allow for a school where there is a case of measles to disallow attendances. Those are two measures that are explicitly authorized by legislation. Normally, New York City allows for people to skip vaccinations if they have a medical reason or a religious reason. 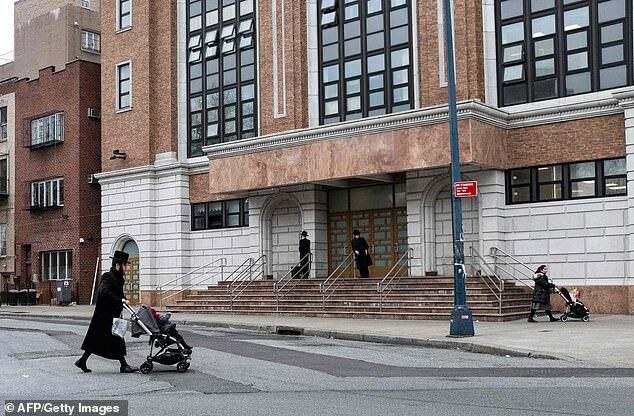 But Mayor Bill de Blasio has rescinded religious exemptions for the select area in Brooklyn where measles is spreading among Orthodox Jews. The order states that as of Thursday morning, any adult or child that has not received the MMR (mumps, measles, rubella) vaccine in four Williamsburg ZIP codes (11205, 11206, 11211, 11249) will be forced to do so. Flouting that rule could incur a $1,000 fine or a six-month jail sentence, officials said. They plan to track unvaccinated people by tracing anyone who may have come into contact with people who have measles. New York City health commissioner Dr Oxiris Barbot neglected to elaborate on whether they would fine people twice if they continued to refuse vaccination. What is the legal framework behind New York City’s mandate? The state of emergency can be declared for the entire state, an entire city, or just certain ZIP codes. It can last for up to 30 days, or until the chief executive (the mayor) rescinds it. In this case, it will last until April 17, though De Blasio does have the power to extend it. The law is broad about what measures the mayor can bring in to bring an emergency situation under control. During the emergency period, anyone who violates the new rules is guilty of a class B misdemeanor, which carries a fine of up to $1,000 or a six-month jail term, according to New York law. Other cities have levied the same threats on citizens. For example, New Jersey has issued a state of emergency during snowstorms, warning anyone who drove during the curfew period would be slapped with a $1,000 fine. There is some debate about whether New York City’s outbreak constitutes a state of emergency. It is one of the biggest outbreaks the city has ever seen – with 285 cases up from two last year. In 1905, the Supreme Court sided with Massachusetts after the state introduced mandatory smallpox vaccines, with a $5 fine for refusal. It had been challenged by Rev Henning Jacobson, who said he and his son had developed allergic reactions to the first vaccine and didn’t want to do it again. The judge ruled that their concerns were not enough to override the public health risk. Many public health experts say it is a valid move, but others fear it will only drive anti-vaxxers further away from mainstream medicine and health authorities. A driving factor behind Brooklyn’s measles outbreak is the circulation of a magazine called PEACH (Parents Educating and Advocating for Children’s Health), a religious illustrated handbook that demonizes vaccines with alarming drawings and storylines. Blima Marcus, an Orthodox Jewish nurse in Williamsburg trying to counteract PEACH with her own magazine (PIE, Parents Informed and Educated), warns the situation is incredibly complex, with layers of cultural beliefs and deep-rooted concerns that could be intensified with a hard-line approach. ‘It’s not getting to the root of the problem,’ Marcus told Gothamist.